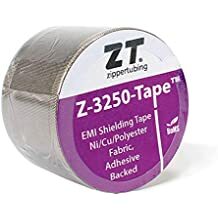 Zip On 63 - Lightweight Jacketing - Wire And Cable Bundling - Products - ZT | Zippertubing Co.
1.25" 1.375" 1.5" 1.625" 1.75" 1.875" 2.0" 2.125" 2.25" 2.375" 2.5" 2.625" 2.75" 2.875" 3.0" 3.125" 3.25" 3.375" 3.5" 3.625" 3.75" 3.875" 4.0"
The product comes standard with an internal overlap flap to meet ground based military application requirements. Zip-On (63) is an economical wrap around cable management jacketing with a soft, flexible, rubber-like texture for general purpose applications. It is made from black color 10-mil or 20-mil Mil-I-631 Polyvinylchloride film material and utilizes Zippertubing's versatile R-Track or Z-Track closure systems. This combination makes Zip-On (63) easy to cut to size and bundle cables in both wire harness fabrication facilities as well as field retrofit situations. The material features good abrasion and fluid resistance and has an operational temperature range of -20 to 105°C. 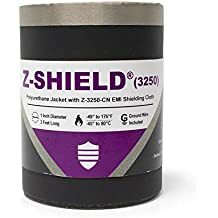 The material is recognized under the components programs of Underwriters Laboratories with a 600 volt (63-10), 700 volt (63-20) dielectric strength and a UL224, VW-1 flammability rating. Zip-On (63) can be configured for Round, Flat or Rectangular shaped cable groupings. The product comes standard with an internal overlap flap to meet ground based military application requirements. Zip-On (63) should be your first choice for moderate environmental performance applications. The Zip-On® family of cable management products are as easy to install as they are to re-open. Whether you are in the field or in the office, the convenience and functionality of Zippertubing&apos;s Zip-On® solutions will more than satisfy your cable bundling and protection needs. These products are available in a variety of materials, shapes and sizes. Refer to Zippertubing's 63-10 or 63-20 data sheet below for specific material characteristics. Width 1.25" 1.375" 1.5" 1.625" 1.75" 1.875" 2.0" 2.125" 2.25" 2.375" 2.5" 2.625" 2.75" 2.875" 3.0" 3.125" 3.25" 3.375" 3.5" 3.625" 3.75" 3.875" 4.0"
The R-Track closure is a small PVC based "Zip-Lock" style closure that is approximately 0.150" wide that can be utilized with all PVC based jacket materials. The interlock has an approximate hoop strength of 10 lbs/linear-inch, is flame retardant and available in Black or Clear (Clear is special order only) colors. R-Track can be closed using thumb pressure alone or with the aid of the "SLR" slider tool. It is best suited for Flat or Rectangular cable applications in sizes up to 1-1/2 inches wide. Ideal Application Flat jackets or smaller jackets that will see low stresses.